Find out why SoundOnSound dubbed it a "real breakthrough"
The next step in the legacy of an icon. The Akai MPC Live gives everyone the ability to make and develop music, all in a portable system. 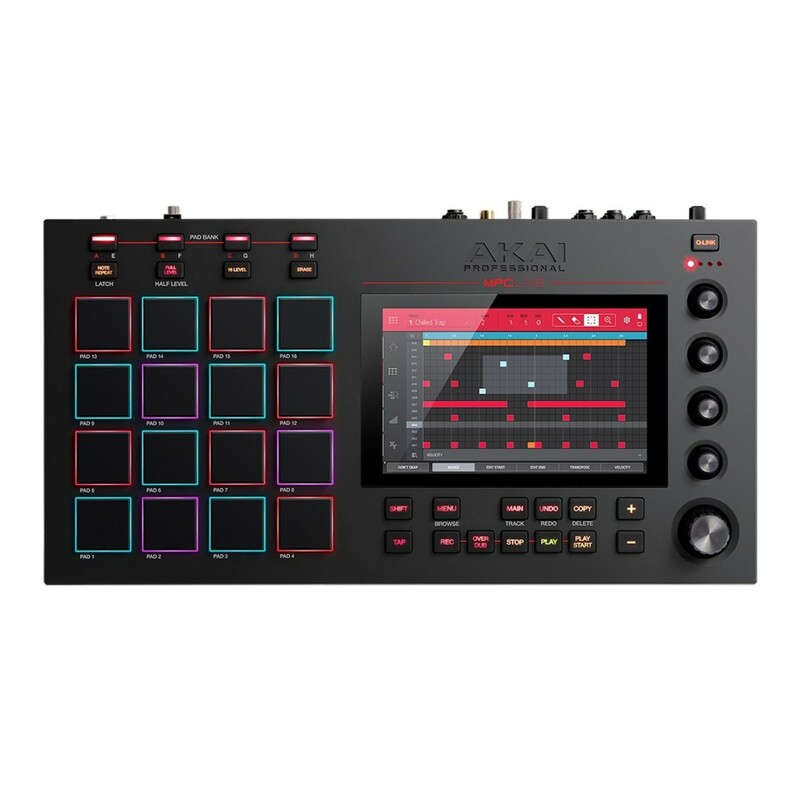 Encompassing the original concepts of the MPC, Akai have produced one of the most powerful production units in the world to date. 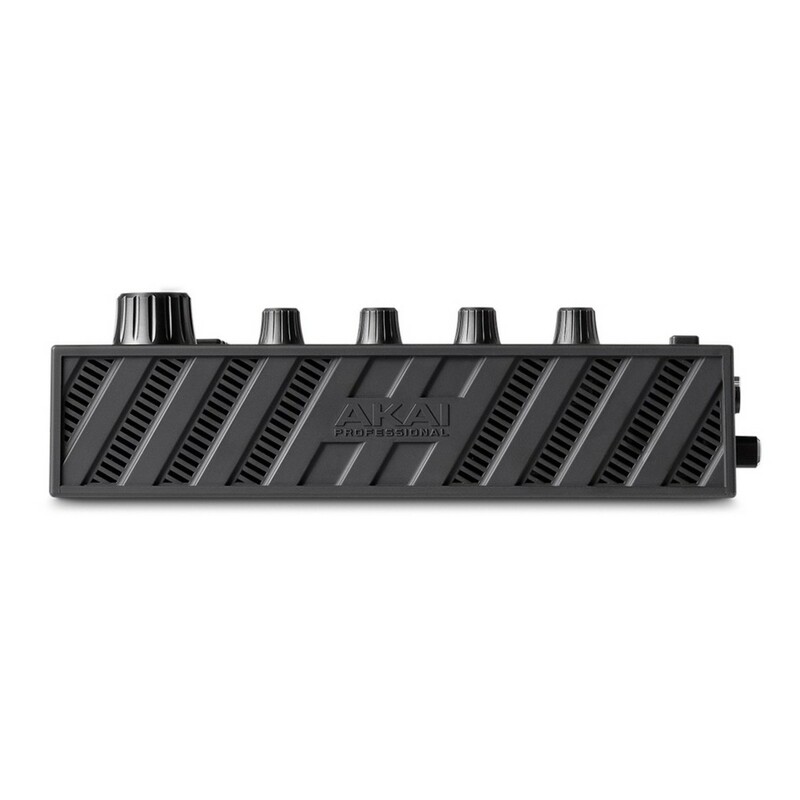 From the creation of the drum beat to the final master of your track, it is all doable on the Akai MPC Live. Your creativity should not just be tied to a desk. On your sofa at home, on a train, or on your lunch break at work, the portability of the MPC Live allows complete access to music wherever you go. Boasting a full colour 7-inch touch screen, 16GB of internal memory as standard, 2GB of on-board RAM and a host of connectivity options, this is truly one of the most powerful production units in the world. Special offer: Until the 31.7.18, new purchasers of Akai Professional's iconic MPC Live and MPC X will receive 5 FREE MPC expansions from MVP Loops including Melodic Horizon, Urban Roulette, Sound Mob, Hook City: Trap & Sound Edition and Hook City: Trap and B Edition. Until the 31.7.18, any new purchasers of Akai Professional's iconic MPC Live and MPC X will receive 5 FREE MPC expansions from MVP Loops. These packs are produced and designed with incredible attention to detail, giving you the most realistic sample sounds possible in versatile packages. In order to redeem the 5 MVP MPC Expansions, register your product here. 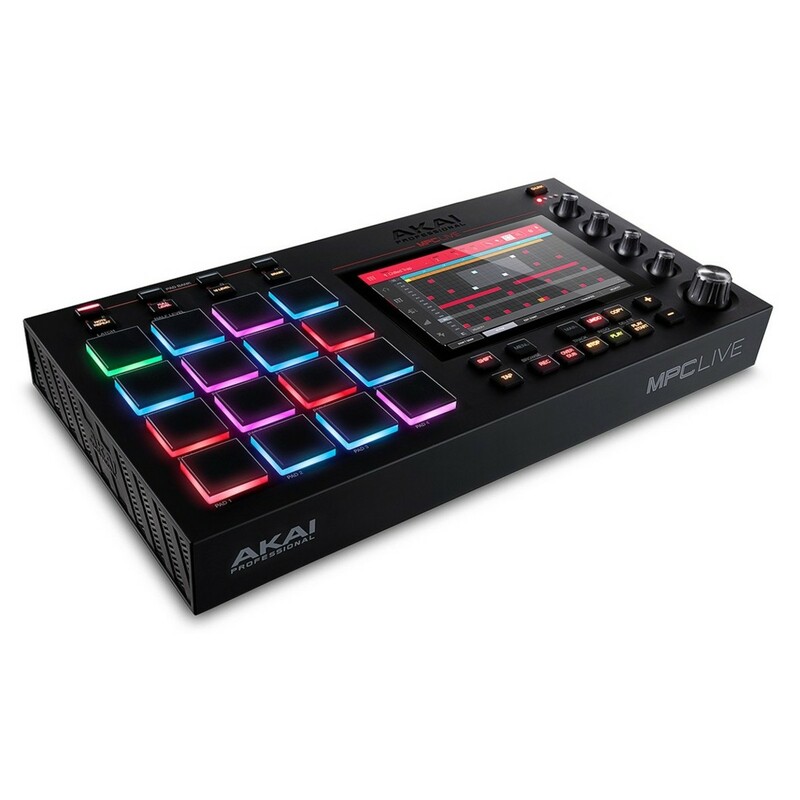 You will be prompted to insert your personal information and proof of purchase for either MPC Live and MPC X if purchased after 1.6.18; once all mandatory fields are populated, a member of the Akai Professional Team will verify your application and forward over instructions for getting your hands on the MPC Expansion Content. The MPC is famed for it’s no-nonsense workflow. 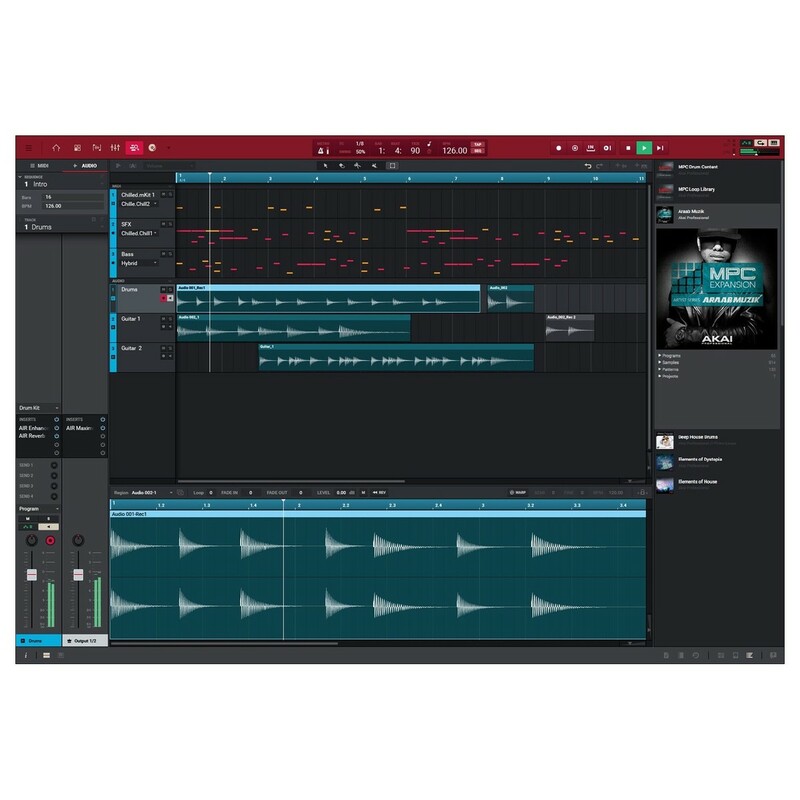 Found in the hands of artists such as Kanye West and John Mayer, the interface is designed specifically, to enhance your workflow. The addition of a 7-inch multi-touch screen means musical expression is literally a touch away. 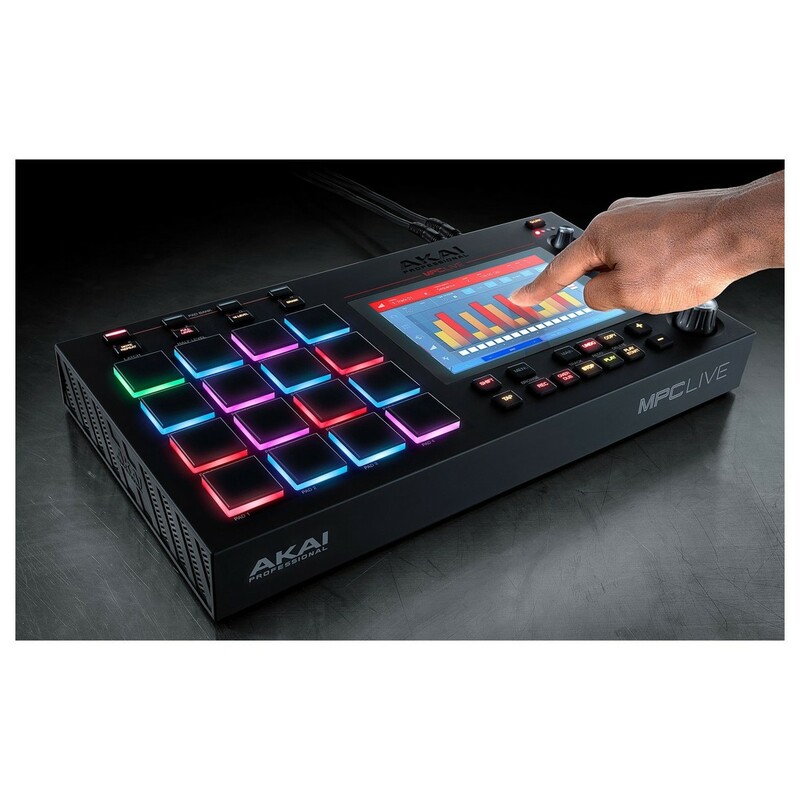 Combined with 16 of Akai’s class leading RGB drum pads (backlit, so they’re suitable for any environment) and four touch sensitive control knobs. These are all assignable to specific triggers, controls and even songs, allowing for seamless transitions with the touch of a button. These are the tools that turn the MPC from a machine into an instrument. 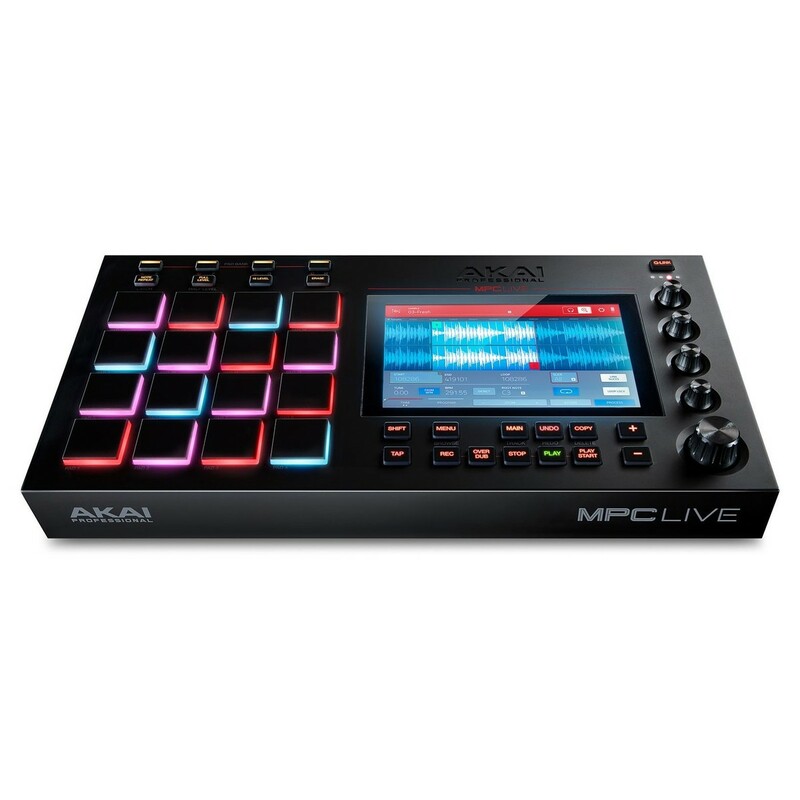 Not only is the MPC Live crammed with high spec technology - it’s also available on the go. The onboard lithium ION battery can provide up to six hours of continuous use on one charge. It runs with the 2GB of built in RAM and 16GB on-board storage as standard. 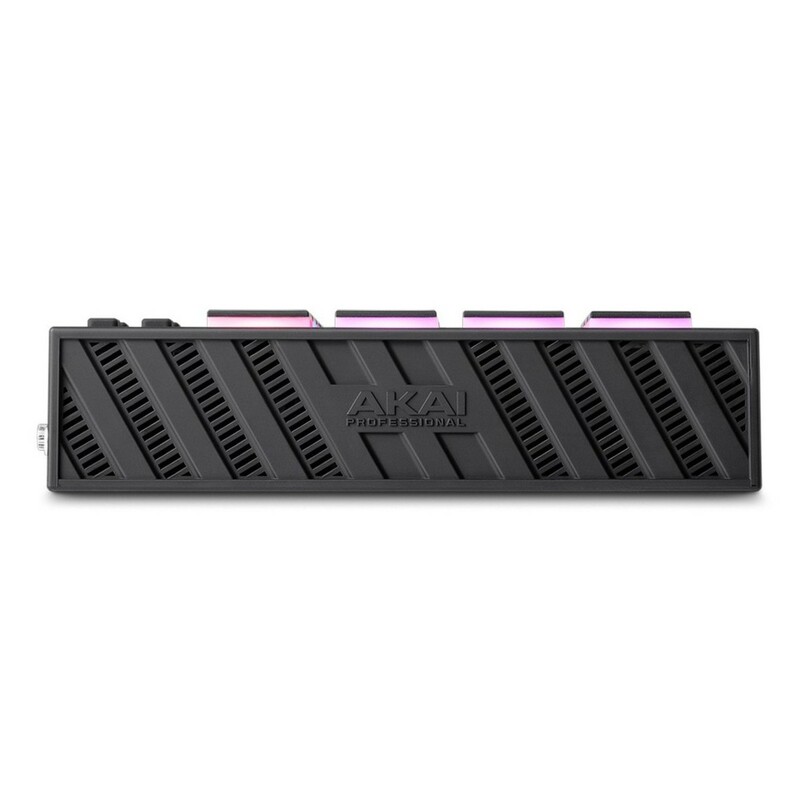 You get up to 256GB additional memory from external HDD or SSD hard drives via 2.5” SATA connector allowing you to have un-paralleled freedom in where you create music. Designed with producers and performers in mind, the possibilities in and outside of the studio are endless. If you’d like to use the MPC in the studio as a sampler, there are dedicated and grounded RCA inputs to accommodate turntables. There are also two additional ¼” balanced inputs for mixers, sythesizers, drum machines and other instruments. Performing live, you can monitor your mixes via the dedicated headphone output. Two sets of classic 5-pin MIDI inputs and outputs mean you can trigger other modules you may have, or it can be used as a 1-in/1-out MIDI interface. Two USB 3.0 connections also support both thumb drives for additional samples and memory playback or MIDI controllers. The MPC not only integrates into your setup, it will become the centre point. The MPC 2.0.5 software comes with a vast array of cutting-edge production tools. Messy real-time pitch-shifting is no longer a problem with the new sampling algorithms for pitch-shifting and time-stretching. Further still, these samples can be individually mapped to one of the 16 pads, allowing you to independently pitch-shift and/or time-stretch. Not only is the software accessible on the MPC Live, but also on a desktop or laptop when in controller mode. 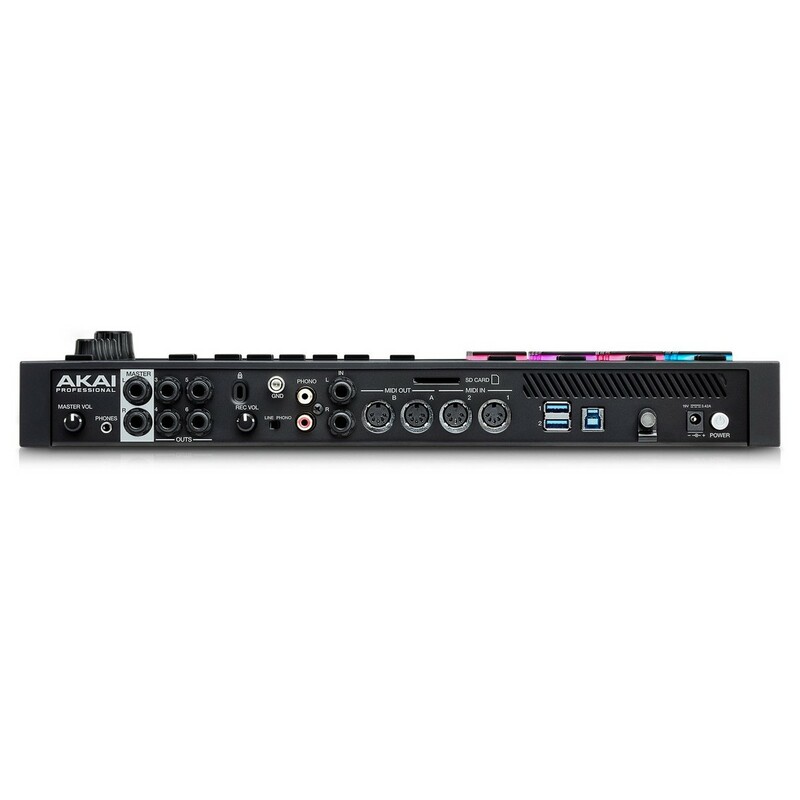 Expand your eight studio-grade audio tracks on the MPC Live up to 128 when in controller mode. 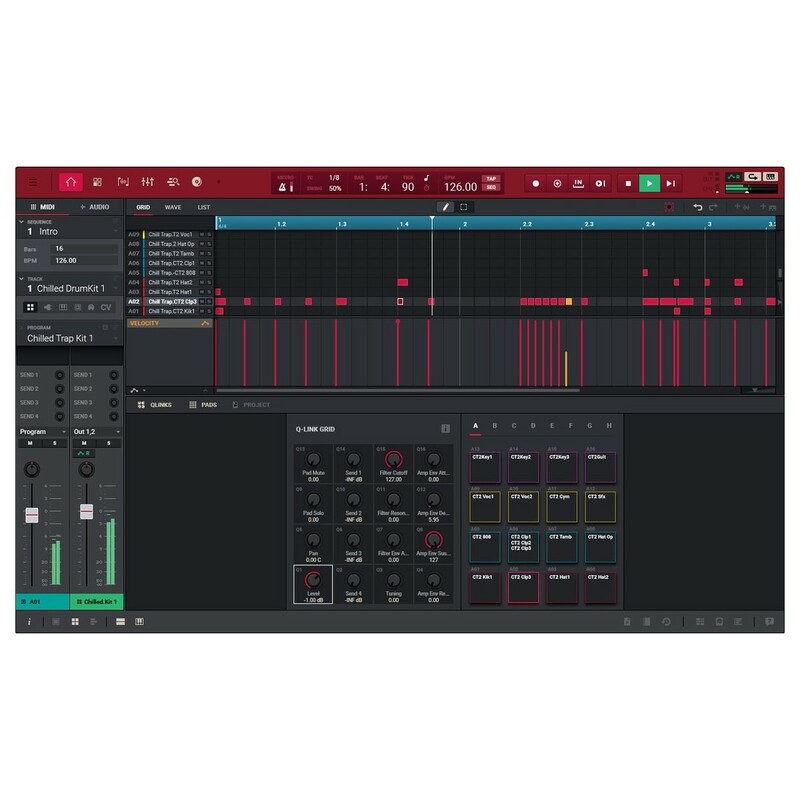 Multi-track capture with multiple monitoring options or make use of the Punch In/Out recording feature. Which is perfect for creating samples like you would a classic analogue sample process. MPC 2.0.5 helps to empower musicians, producers, and performers alike. This update has made Ableton and any other ‘Link’ enabled software even easier to connect as you can now sync your MPC via Wi-Fi. The built in Bluetooth 4.0 MIDI support also means linking Bluetooth controllers to trigger and control the hugely powerful MPC instruments and kits is easier than ever. Cross-collaboration has never been as simple as it has with the MPC.